Standard Redco blue nylon kiln wheel bushings are a cost-effective and proven solution as a kiln wheel bushing. The nylon used in these bushings is head stabilized to handle long drying periods in the kiln. These bushings should not be used in sawmills where they will be exposed to very cold temperatures for a sustained period as nylon becomes brittle below -12 Celsius. A premium kiln wheel bushing we’ve been developing on at one of our western American branches the last couple of years. The yellow bushings in testing outlast and outwore the blue nylon bushings significantly and use a proprietary material we’ve developed to replace Redco blue kiln wheel bushings at a modest cost premium. The yellow bushings have more than paid for themselves in increased lifespan and, yes, they make the carts run smoother as well. These bushings are a direct substitution for Redco blue nylon kiln wheel bushings but are still not the correct choice in very cold weather environments and do not have increased load capacity over the regular blue. Phenolic kiln wheel bushings are used in high load (36,000lbs+) applications or where extreme cold is involved. Due to the properties of phenolic material (a fairly high coefficient of friction), it is recommended to put a grease groove in the bushing. To work with a Redwood representative on your next kiln wheel bushing order please contact us. 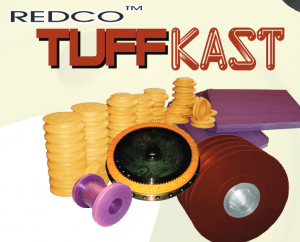 Redco™ Tuffkast and Nylon have similar applications in the world of plastics such as bushings, bearings, sheaves, pulleys and even outrigger pads. Some customers get confused between the differences in the material and still others are wary of Tuffkast because, as a Redwood Plastics proprietary plastic, it is not nearly as well known as nylon. Nylon is a plastic developed around the time of the Second World War, whereas Tuffkast is a co-polymer (made of different plastic types). Tuffkast is much newer and is slowly penetrating the plastic industry. Many of Tuffkast’s properties counter potential weaknesses of nylon material. 1.) Nylon has some of the highest moisture absorption among industrial plastics at 4% on average (after 24 hours saturation). Tuffkast on the other hand will only absorb up to 0.5% moisture in the same time frame. 2.) Nylon does not handle shock or impact well, but this is a strength of Tuffkast. 3.) Nylon gets brittle in cold temperatures while Tuffkast has much better low temperature properties. As with any comparison there are tradeoffs in selecting Tuffkast. Tuffkast is too “soft” for some applications meaning nylon would still be the optimal material choice. Tuffkast is also more expensive: about 30-50% more than nylon by weight. Regardless, as a company we see applications every week that are better served by Tuffkast. Be sure to consider it for your next project. For questions on our Tuffkast, nylon or other plastic materials contact us today. North America is finally beginning to thaw after our brutal winter. In areas in the Midwest, Central Canada and the East Coast – crane rental companies, concrete pumpers and even tree service crews are getting ready to take advantage of the upcoming 2014 work season. This is the time of year our customers consider new equipment purchases and Redco™ Outrigger Pads are an excellent investment. These pads are very popular in Europe where wooden pads are illegal in several countries. Wood – while cheap – is an organic material that will rot and could put people and equipment in danger. Unfortunately, North America lags in this simple safety solution that makes sense. Redco™ Outrigger Pads, made of the engineering-grade plastics UHMW or cast nylon, will not rot, rust or support mold growth. They are UV-stabilized and will provide many years of use. Unlike wood, plastic pads get stronger in cold weather. Money is saved over the long-term as wooden pads do not need to be purchased or made – all that time and/or money adds up. However, your crew also has piece of mind that the critical load of the crane rests not on crack-prone plywood but performance plastic instead. The outrigger pads are available in a number of options*. Pads can be machined with an anti-slip surface or made out of our superior LUNS material using a non-toxic, integral, coal-slag surface. Pads can made square or round and we can manufacture them from 12″-48″ in diameter. 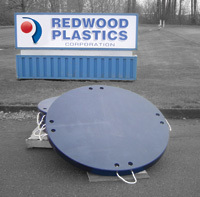 Contact us for a quote or email us at sales@redwoodplastics.com with any questions. In the breadth of Redco™ products, certain plastics stand out for different reasons. When it comes to “strength” and “resiliance” Redco™ Tuffkast certainly has a niche. Tuffkast is a co-polymer and improves on many of the inherent qualities in nylon. Excellent impact values, wear resistance and rigidity. But Tuffkast also improves on nylon’s major deficiency – water absorption. In comparison to regular cast nylon, Tuffkast absorbs moisture minimally. Also, in comparison to other nylons, Tuffkast’s properties in low temperatures have been improved. TUFFKAST 020 – Carriage Wheel Material – Special formulation for sawmill carriage wheel applications. TUFFKAST 015 – Oil Filled – Liquid lubricant impregnated. Offers excellent surface lubricity for wear resistance and reduced co-efficient of friction. TUFFKAST 010 – Solid Lubricant – Typically used for dynamic friction applications that are subjected to extreme stress and impact. 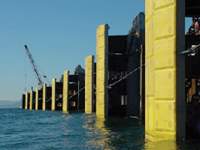 Perhaps one of the best application case studies with Tuffkast are the dock fenders installed at the B.C. Ferries terminals in Tsawwassen, BC. In a massive storm in 2006 the ferries repeatedly crashed into the fenders over an almost 24 hour period. The result? The fenders held up needing no repairs – minus one tile of one fender that required replacing, due to damage from a protruding ferry part but not due to impact. A post-storm analysis revealed that were it not for the Tuffkast pads, the wooden docks would have likely been destroyed. Earlier this year a customer of ours contacted us, frusterated with the performance of their existing kiln cart bushings. The carts were very difficult to move – so much so that motorized equipment was being used to pull and push them through the kiln. 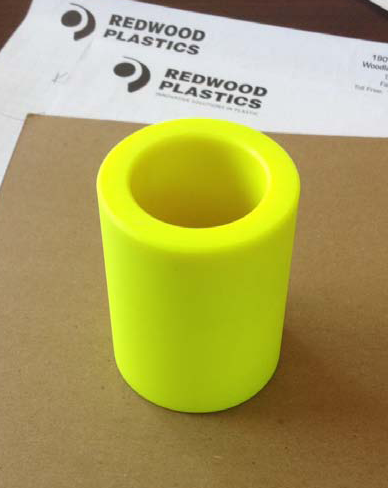 Our solution was a new bushing made of a variety of advanced PVM “Pressure Velocity Maximum” cast nylon with an added safety yellow color (to avoid confusion with the existing blue nylon bushings). These bushings performed beyond expectations – the kiln carts now move so freely through the kiln that the only problem is stopping them!